Blackthorn Walking Sticks are the perfect gift for Father's Day 2019, order your Irish Shillelagh today from a name you can trust. Irish Heritage sweaters not only make you feel a connection to Ireland but also are one of the most fun sweaters to wear out and about daily. Feeling toasty and warm yet soft to the touch this wardrobe stable does not stop giving. Our comfort fitting polo neck allows you to feel the freedom of a open neck yet easy to retreat into when chills beckon. Made from 100% Merino Wool. Do not accept wool blends or acrylic wool in your sweater. 100% is a natural insulator regulating your temperature. One of the main features is that this will hold its shape and last for years and years. 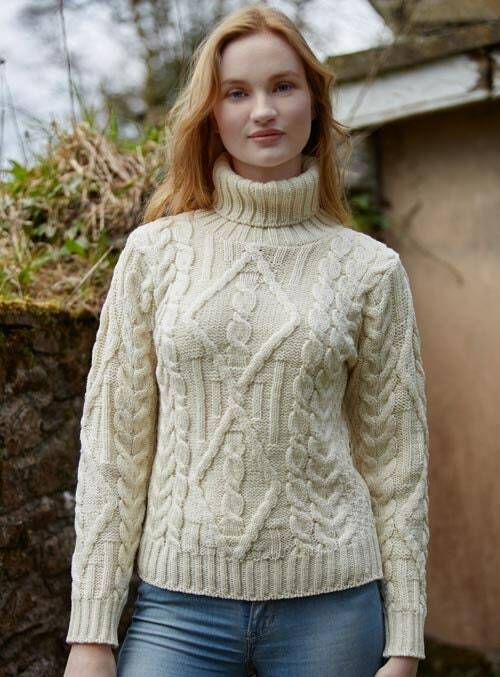 Every Lady with Irish Heritage should have this wardrobe staple in their closest as it's such a versatile sweater. Still reading this far and you haven't added it to your cart! The color alone works so well with jeans or a smart skirt. Be prepared to have compliments and admiration each and every day you take out your heritage sweater for a stroll. Easy to care for wash in low temperature with Woolite or similar. Same as for any 100% wool product. Made in Ireland. Thanks for reading and please help support my store and family.